Create work instructions (static or animated) directly from virtually any 3D CAD model. For information on authoring on work instructions, click here. Now with iXVL Publisher, these Work Instructions can be deployed on portable Apple® iOS devices, such as the iPad®. Free to view on any platform. Faster learning curve from multiple modes of instruction. Better comprehension from interactive 3D models. Fewer mistakes; less rework, lower costs. Lower production costs – author once and publish to many different formats. Reduced translation costs – can use 3D models and 2D illustrations to minimize text. Static or interactive with 3D animations. Published to different formats for PCs or mobile devices. 3D models, 2D illustrations and text instructions. Human mannequins to show positions and assembly techniques. Tools and equipment used in each task. Bill of Materials: mBOM and eBOM. With robust capabilities such as manufacturing kits. XVL Studio Standard/Pro is used for authoring work instructions. All options for accessing (consuming work instructions) are FREE from Lattice Technology, click here to see all the options. 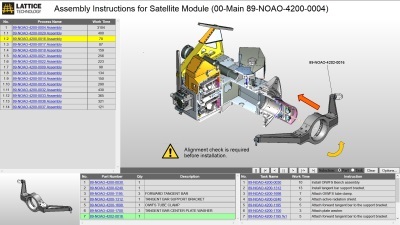 Drag and drop parts and assemblies to build the mBOM (manufacture and process trees). Import/export the mBOM from other systems. Auto-update the mBOM when the eBOM changes. Automatically add callouts, which are easily editable. Create animations either automatically from the assembly tree or with drag and drop to make custom animations – no animation skills required. Automatically calculate camera moves and edit. Easily add humans, tools and equipment. Automatically calculate the work times. Publish to multiple formats – HTML, Microsoft Excel, Apple Inc.'s iOS for use on the iPad and other iOS devices. Template based publishing can be customized to meet each customer’s required documentation standards. iXVL Publisher – for publishing to iPad, iPhone. iXVL Player – for viewing interactive 3D work instructions on iPad. XVL Player – for viewing interactive 3D work instructions in HTML. Lattice3D Reporter – for publishing to Excel. XVL Web Master – for publishing to HTML.